Photo of a pro-independence rally by Carles Masats. It’s 2019. California just voted to secede from the Union in a referendum. Only 42 percent of the electorate voted, but since 90 percent of them voted in favor of independence, the California Governor has unilaterally declared independence. The other 49 state legislatures have not been consulted. The US House of Representatives and Senate have not been asked either; their required two-third majority agreement stipulated by the Supreme Court in Texas v. White (1869) all but ignored. The US Constitution has, of course, not been amended. The Yes California campaign and the California Governor are defending their unilateral independence as the only democratic outcome and in compliance with international self-determination rights. Many observers fear a strong rebuttal by the White House as the National Guard is already mobilized at the California borders with Arizona, Nevada and Oregon. Sounds unreasonable? Not so in Spain. On September 6th, 2017, the Catalan parliament, where pro-referendum parties had a majority of seats albeit not a majority of votes, passed a law calling for a referendum on independence. The Spanish Government deemed it illegal under the current 1978 Spanish Constitution and asked the Constitutional Court to void the law. The Constitutional Court duly obliged because the 1978 Constitution has to be amended by a two-third majority of the Spanish Congress before a regional referendum can take place. Unfazed, the Catalan Government held the by-now illegal referendum on October 1, 2017. The Spanish Government sent National Police and Civil Guard riot squads to stop peaceful voters from reaching the ballot box. The ensuing images of unnecessary and unjustified violence have shaken coexistence in Catalonia, the rest of Spain and Europe at large. The Spanish Government has justified police actions as necessary to restore law and order, but Amnesty International has called police force excessive and disproportionate. How did we get here? One observer in the Spanish press called it “a train crash” using the metaphor of two trains set to crash without anybody capable and willing of finding the signal box to change course. One train was operated by Spanish Prime Minister Mariano Rajoy. His conservative party, drowned by corruption scandals that lead to more than 60 court prosecutions, has been irresponsibly fueling the flames of anti-Catalan Spanish nationalism since 2010. Rajoy’s refusal to engage in dialogue with the Catalan government to find a negotiated solution to Catalan demands to vote and instead take a purely law and order position has repeatedly played into the hands of Catalan pro-independence parties. Rajoy’s political incompetence and partisan use of Spanish nationalism to obscure his party’s corruption have done a disservice to the country. When small groups of Spanish nationalists were cheering “go get them [Catalans]” to the National Police and Civil Guard reinforcement sent to Catalonia, Rajoy remained silent. Rather than convince Catalans that remaining in Spain is better for them and the rest of the country and embracing the diversity that Catalans offer Spain, Rajoy showed a remarkable lack of sympathy. Rajoy is not, however, a tyrannical despot, as many Catalan nationalists proclaim and Spain is still an imperfect liberal democracy, just like any other. The other train is operated by the Catalan premier Carles Puigdemont. Catalan nationalists have enjoyed a better reputation than nationalists elsewhere in Europe. They fought against the dictatorship of Francisco Franco, who banned their language and symbols for 36 years; fought for democracy in the 1970s and have been considered pro-diversity and pro-democracy. Some of these claims no longer hold true. While Catalan nationalists claim that Spain is not behaving democratically by rejecting their right to vote in a referendum, they are themselves embracing authoritarian measures. 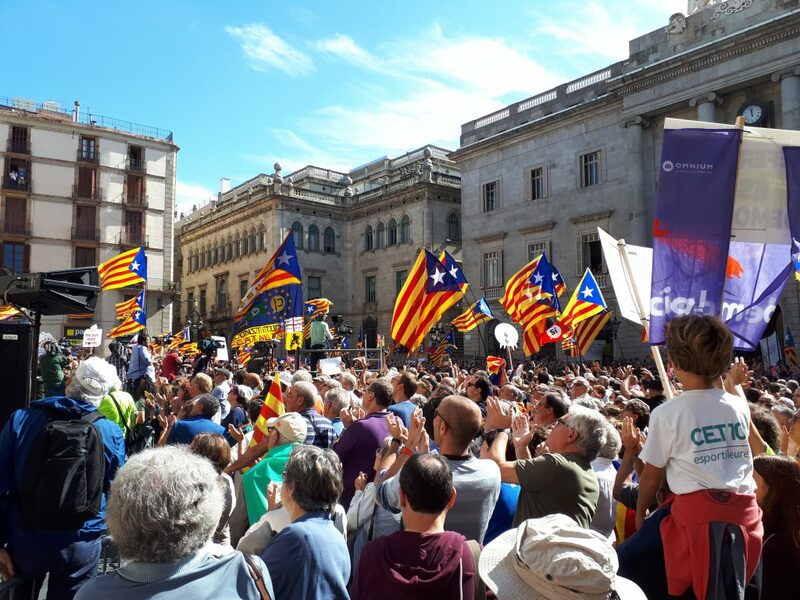 The nationalist-dominated Catalan parliament has willfully ignored and vilified opposition to its referendum, has been willing to forgo democratic legislative procedures that guarantee pluralism and fair game (some people talk about a parliamentary coup d’état in Catalonia), and has ignored the silent disapproval of a large section of the Catalan population dismayed at his push for an illegal referendum without minimum participation that is supposed to lead to a declaration of independence within 48 hours of a yes victory. Today, we find in Spain two uncompromising sides of the same nationalist mirror that are content to impose their agenda without negotiating with those who oppose them and, more problematically, claim to speak in the name of the majority of their population. Rajoy does not speak in the name of a majority of Spaniards any more than Puigdemont speaks for a majority of Catalans. Common Spaniards are being ill served by these speeding trains to nowhere. Unless they are able to halt them, establish a dialogue, and set up mechanisms that can guarantee that the voices of all Spaniards, Catalans included, are heard, Spain, borrowing from the philosopher José Ortega y Gasset, will remain invertebrated. Aitana Guia is Assistant Professor in Modern European History, California State University, Fullerton. She is the author of The Muslim Struggle for Civil Rights in Spain: Promoting Democracy through Migrant Engagement, 1985-2010 (Sussex Academic Press, 2014).